Some like it hot—for a reason: Men who love spicy tastes tend to have higher levels of testosterone, finds new French research. In the study, men sat down to a delectable dinner of mashed potatoes, which they were allowed to flavor with as many Tabasco-sauce capsules as they desired. Guys with higher T doused their mound with more of the eye-watering peppery sauce than those with lower levels of the hormone. They also rated their meal as spicier. Testosterone is related to stereotypical masculine preferences and behavior, such as physical aggression and daring or risky actions, says study author Laurent Bègue, Ph.D. And those are some of the same traits that drive people’s peppery preferences. However, the researchers can’t discount that it might be the habitual consumption of the hot stuff that’s actually spiking the testosterone levels. 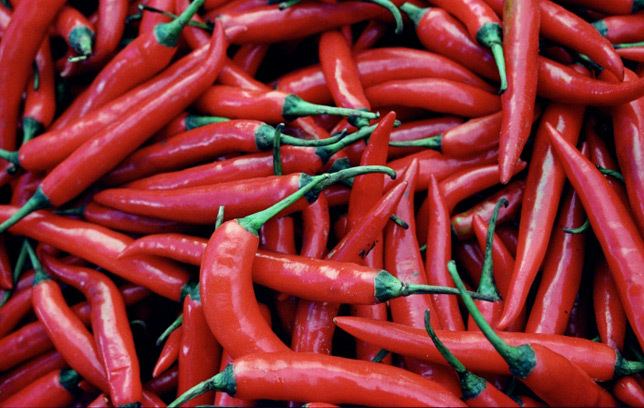 Studies in rats have shown that eating hot peppers can spark the release of that hormone, says Bègue.